An excellent 1st/1st copy that has been signed, lined (with a quote from the book) and dated by the author, and signed and dated by the artist David Wyatt, who has also hand-drawn a .large sketch within - a beautiful copy, very rare and unusual. Neverland is calling again Something is wrong in Neverland. 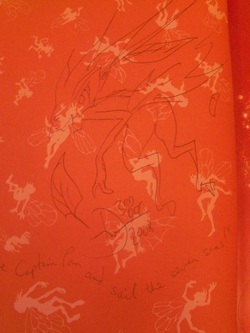 Dreams are leaking out-strangely real dreams, of pirates and mermaids, of warpaint and crocodiles. For Wendy and the Lost Boys it is a clear signal-Peter Pan needs their help, and so it is time to do the unthinkable and fly to Neverland again. But back in Neverland, everything has changed-and the dangers they find there are far beyond their dreams.Specially commissioned by Great Ormond Street Hospital for Children as the winner of their competition to write the official sequel to J.M. 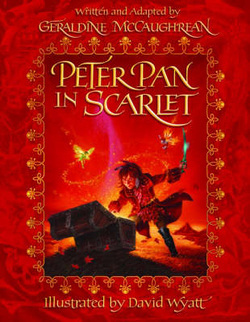 Barrie's Peter Pan, Peter Pan in Scarlet is a thrilling adventure that you will never forget. Proceeds from every copy sold will go to benefit Great Ormond Street Hospital for Children. This new version brings the adventure to new life with full colour illustrations throughout by David Wyatt, and a new version of the text by Geraldine McCaughrean, to make the story accessible to younger readers. A beautiful book to share and to treasure. 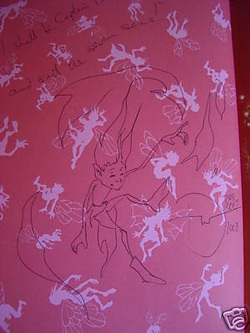 Note - the drawing below is one of a number, and may not be the one you receive.